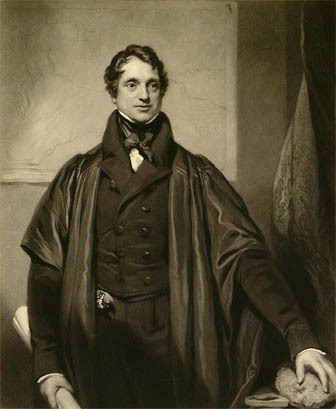 Adam Sedgwick in his prime (age 47). He would live to be almost 90. I cannot promise to teach you all geology, I can only fire your imaginations. Adam Sedgwick was a Cambridge-educated geologist who reshaped the study of this science by emphasizing research on rock strata and the millions of years in the timescale of geologic history. Although considered very forward-looking in his view of geology, he remained an opponent of Darwinian evolution throughout the entirety of his long career. As the scientist who set forth the existence of the Devonian and the Cambrian periods (both of which he named), Sedgwick traveled the length and breadth of England engaged in his research into the rock record. Although virtually self-taught as a geologist–he had studied theology and mathematics at Trinity College, Cambridge, and had taken holy orders–he nevertheless became one of the leading research scientists of his day. In 1822, he headed to the Lake District to continue his studies, a trip on which he met William Wordsworth and Robert Southey, by then two of the best-known Lakeland Poets, as well as the chemist Robert Dalton, the Cumbrian founder of modern atomic theory. He worked closely with fellow geologist Roderick Murchison; the two of them, along with Sedgwick’s later colleague Charles Lapworth, resolved the major outlines of the system that is used today to organize geologic “periods”: in order, Cambrian, Ordovician, Silurian, and Devonian. From 1834 on, Sedgwick was a canon (a resident Anglican priest) of Norwich Cathedral. He began his hostility to evolutionary thinking as early as an 1845 letter to Charles Lyell in which he attacked the conclusions of Richard Chambers’s anonymously published and materialistic Vestiges of the Natural History of Creation: “If the book be true, the labours of sober induction are in vain; religion is a lie; human law is a mass of folly, and a base injustice; morality is moonshine; our labours for the black people of Africa were works of madmen; and man and woman are only better beasts!” Although Charles Darwin had been a student of Sedgwick’s (in 1830, before the HMS Beagle expedition), and the two corresponded for decades, they would part company completely over the argument set forth in Darwin’s On the Origin of Species by Means of Natural Selection, or the Preservation of Favoured Races in the Struggle for Life (1859). Sedgwick’s view was that any scientific outlook that might challenge the likelihood of personal immortality was such a threat to the individual human being that it had to be challenged at every turn. Just as he had been unwilling to accept the 1844 argument in Vestiges for a “developmental hypothesis” (life changed under specific environmental conditions, so that the world we see before us today is radically different than the one that existed 10,000 years ago, much less a million years ago, much less at the dawn of time), so Sedgwick was completely opposed to any view that rested all of its authority on a materialistic view of life, without any necessary regard for moral thinking or divine interposition into historical time. Indeed, it is hard to imagine what a scientist like Sedgwick would think of fellow Cambridge-researcher Stephen Hawking’s recent claim that the universe had no beginning and that it will have no end; it has simply existed forever–in different forms to be sure–but without the limiting human assumption of a necessarily linear start or finish.